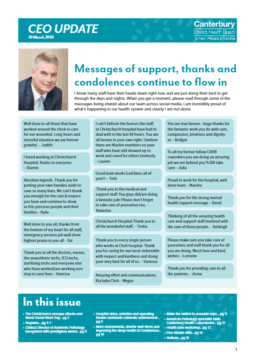 Chief Executive David Meates shares messages of support, thanks and condolences for the Canterbury health system, including a personal and heartfelt message from His Holiness Pope Francis. Also, to mark World Social Work Day, this edition features the experiences of the Canterbury DHB social work team who have supported families affected by last Friday’s terror attacks, as a timely example of the significant contribution made each and every day by social workers across the health system. This issue also recognises staff who have recently graduated and received awards, highlights the work of the Sleep Health team in diagnosing and treating people with sleep disorders, invites staff to make the switch to reusable cups and bottles, and much more.